We shall choose wine to cheese and seafood. How do we approach this? This tasting will show how to choose matching white wines to cheeses of different characters and to seafood, natural shrimps and shrimps in a spicy Thai soup. In contrast to the other wine lessons we start with the food and its flavours and based on this we choose the most suitable wines. Therefore, first a little about flavours in the food. Under the tab Sparkling Wine, suggestions are given on cheeses suitable to champagne and sparkling wine. Look at the end of that wine lesson. The same basic principles apply regardless of what dish you have, so what is said below about cheese apply to all food dishes. See also under the tab Flavours, Useful Advice and Grapes and Food. Therefore, when choosing wine to cheese you have to find properties of the cheese which can make the wine taste better and vice versa. In particular the relationship between the fat, saltiness, acidity and maturation of the cheese and the freshness, astringency and sweetness of the wine are important. And of course the flavour intensity both of the cheese and the wine has to match. A tasteful cheese has to be matched by a more flavourful wine than a mild cheese. The acid in wine with high acidity, such as Riesling or Sauvignon Blanc, cut through fatty dishes. Fatty food reduces the experience of the acid in the wine. The wine is perceived as less fresh with fatty food, such as butter, cream and olive oil. On the contrary if you want to enhance the experience of acid in the wine, you can choose food containing a little sweetness. If you have a dish which is acid (from wine or lemon) and want to reduce the perceived acidity you should choose a wine with distinct fruit acid, such as Riesling or Sauvignon Blanc. Acid goes well with acid. The wine is also perceived less fresh. The acidity in the wine is together with the sweetness of the wine the two basic flavours which influence the character of the wine the most. Goat cheese, for instance, which is high in acidity, goes well with wine made of Sauvignon Blanc. Hot spices like chilli or hot spice blends like curry, make the wine taste bitter and the spices hotter. A wine with a little sweetness will reduce the feeling of bitterness and heat. If the wine has aged in barrels, it may obtain a little bitterness from the oak barrel. The bitterness is enhanced if the food is sweet or spicy. Also in this case a white wine with a little sweetness is a good choice, it is simply difficult to fail with a white wine with a touch of sweetness. Avoid dry and fresh white wines to spicy food. Aged cheeses are often very salty with intense flavours and much umami. 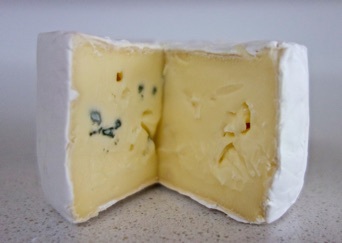 Blue cheeses also have distinct aroma of the added mould. All of this together brings out bitterness and metallic tastes from the wine. To such flavourful food a white wine with distinct sweetness should be chosen. Fatty fish and shellfish are rich in umami. Also in this case a white wine with a little sweetness is the best. If you prefer to serve a dry white wine, then serve some richer (fatter) additions to the fish or shellfish. For white wines always keep an eye on the sweetness when matching with food rich in umami. Another important factor is the degree of oak in the wine. A wine with distinct oak character is often perceived as bitter in combination with umami rich food. If the food is salty the wine is perceived as less fresh, less acidic. Saltiness and sweetness is a good combination. Almost all wines contain a certain amount of sugar because the yeast did not convert all sugar into alcohol during the fermentation. White wines are therefore described as dry, semi-dry, semi-sweet or sweet. Raw fruits and vegetables (peppers, carrots) are often sweet and contain umami which makes the wine feel acidic, bitter and harsh. Choose a wine with a little sweetness.The sweetness of the wine will then be balanced by the sweetness of the food and the overall impression is less sweetness. Sweetness brings out the best of sweetness and saltiness and sweetness is a good combination. Try things out and you will be surprised. Avoid dry, fresh wines to dishes with sweetness. Sweetness of the wine makes the food feel less sweet and vice versa. Sweetness in food also makes the wine feel fresher (enhances the acid). A white wine without residual sugar served with food containing sugar rich preparations of fruit and berries for example jellies and chutney will be perceived as very fresh and very dry and may also appear a little bitter. Difficult to combine food and wine? The universal trick to get the combination to work is to choose a wine with a little sweetness and avoid wines with distinct oak character. In addition choose, if possible, a wine with lower alcohol content. In this wine tasting we will test which white wine(s) of different degrees of sweetness will match the cheeses and seafood best. Cheeses selected for the tasting are presented below. General information about different types of cheeses can be found under the tab Cheese Types. 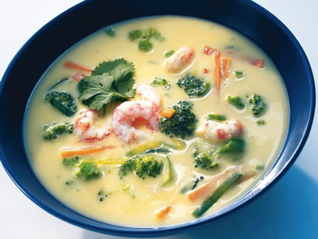 Spicy Thai soup with shrimps. Recipes are found under the tab Food Recipes. More information of the suggested wines is found below. This tasting needs a special form of Tasting notes which you can find here and print. Rank how the four wines match the various cheeses and seafood on a scale 1 to 5, where 1 is a bad match and 5 is an excellent combination. You can rate all wine-food combinations but It is not necessary, it is enough to rate the best wine for each cheese or seafood dish. After the tasting the scores for each food-wine combination are summed up. 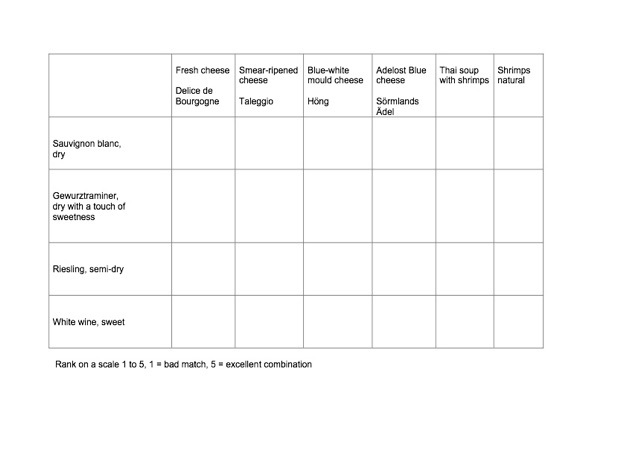 The wine with the highest scores is the best choice for the food dish in question according to the participants. Compare with the theory given above and for the specific cheeses below. 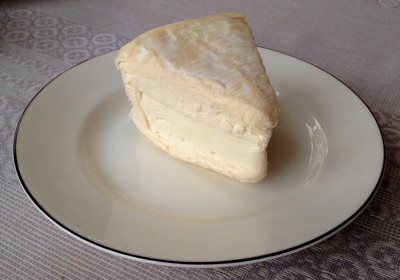 Delice de Bourgogne is a French fresh cheese made from cow´s milk. It is a so-called triple crème cheese with a fat content of about 70 %. It has a rich flavour and a smooth, melt-in-the-mouth texture. The white rind with its mushroomy aroma contrasts to the rich, creamy, buttery and tangy notes of the interior. This high fat cheese may pair well with a fresh and fruity white wine. Taleggio is a smear-ripened Italian cheese. The cheese has the characteristic orange colour, typical of smear-ripened cheeses. Taleggio is soft and smooth but the core may be slightly crumbly. The surface has a thin crust with a tendency to the formation of mold. The crust is not very nice but it is so thin that there is no need to cut it off, it is enough to scratch it gently with a knife. Taleggio has a mild, fruity, slightly spicy flavour and often a touch of bitterness with hints of mushrooms or truffles when it is at its best. It goes well with ripe pears or figs. Maybe the flowery Gewurztraminer will pair well? Höng Blåvit 43 % is a Danish, mild and aromatic blue mould cheese with white mould rind. The flavour is creamy and fresh. 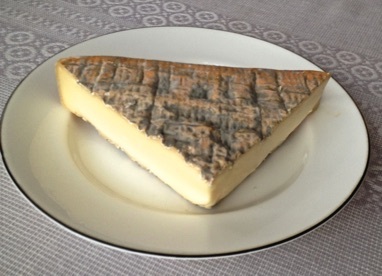 Cut surface is yellowish with spots of blue mould and the texture is creamy. It is made of pasteurized cow milk. A semi-dry Riesling might match well because the sweetness of the wine should moderate the saltiness of the cheese and the high acidity of the wine balance the fat in the cheese? Sörmlands Ädel is a Swedish, creamy, blue mould cheese. 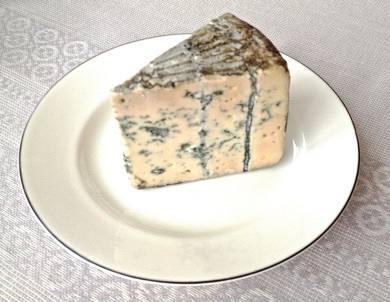 The blue-gray veins running throughout are a distinctive feature of the cheese. It is made from cow´s milk. The texture is softer than Roquefort but firmer than Gorgonzola.. It is milder than Roquefort and not as creamy as Saint Agur but the creaminess is there. The flavour is well balanced, powerful, with just the right saltiness and a somewhat nutty flavour. And the aftertaste is soft. The sweet wine should be just right for this cheese. 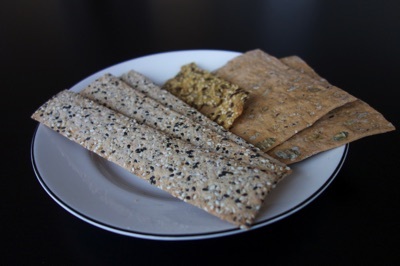 Bread, biscuits, crisp bread or flat bread are the most obvious accessories to cheese. However, avoid salty biscuits, the cheese is usually salty enough. Vegetables like celery, radishes, peppers and fresh mushrooms taste good to most cheeses. Fruits, both fresh and dried, such as pears, apples, exotic fruits and dried dates, apricots and plums are also delicious to cheeses. Avoid grapes, they make the cheese taste bitter. 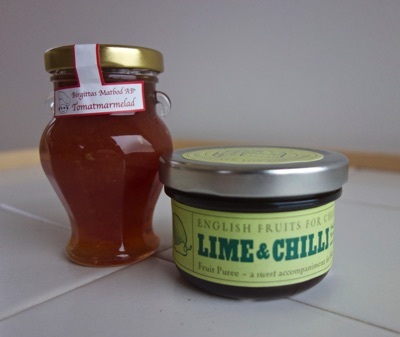 Marmalades pair well with cheese but do not forget that when you combine with sweet sides the wine must also be a little sweet to match. Roasted nuts and almonds, honey roasted peanuts and pine nuts are also a good combination. 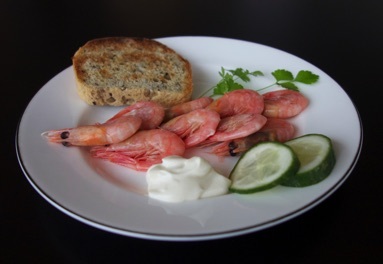 Recipe of Fröknäcke is available under Food Recipes. Shellfish are high in umami and therefore a touch of sweetness in the wine should match well. 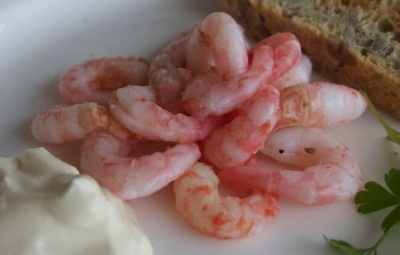 If a really dry wine is served then add some richer sauce to the shrimps. Recipes of mustard crème fraiche and bread to toast are found under the tab Food Recipes. Maybe a wine with a little sweetness should pair well with this dish? Recipes of the Thai soup and levain bread are available under the tab Food Recipes. Many of the suggested wines on this web site may be bought in your country. Refer to Wine Searcher to find retailers. 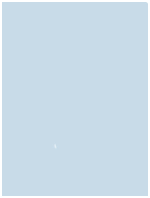 The number links to Systembolaget´s information. Hunter´s Sauvignon Blanc from New Zealand, price about 10 euros. 6202. Producer: Hunter´s Wines. Light, dry, crisp and very fresh wine with notes of passionfruit, nettles, gooseberries and lime. Alcohol content 13.5 %, sugar less than 3 grams/liter. Grape variety Sauvignon Blanc. Gewurztraminer Réserve Hennÿ, from Alsace, France, price about 12 euros. 2176. Producer: Preiss Hennÿ. Medium-bodied, dry, floral and aromatic wine with taste and aroma of lychee, pineapple, honey and elders. Alcohol content 13.0 %, sugar 6 grams/liter. Grape variety Gewurztraminer. Ruppertsberger Hofstück Riesling from Pfalz, Germany, price about 7 euros. 5914. Producer: Ruppertsberger Weinkeller Hoheburg eG. Medium-bodied, semi-dry, crisp and fresh wine with taste and aroma of honey, pears, elders and citrus. Alcohol content 11.0 %, sugar 28 grams/liter. Grape variety Riesling. Lenz Moser Trockenbeerenauslese from Burgenland, Neusiedlersee, Austria, price about 15 euros. 12920. Producer: Lenz Moser. Full-bodied, very sweet wine with nuanced, very fresh aroma and taste of orange marmalade, saffron and pineapple. Alcohol content 12.0 %, sugar 141 grams/liter. Grape variety unknown. Information about the grape varities Riesling and Gewurztraminer is available under the tab White Wine Styles. The sweet wine Lenz Moser from Austria has the designation Trockenbeerenauslese. Although this wine comes from Austria the classification is the same as in Germany, i e the wine is classified according to maturity and natural sweetness. The highest rated wines are without exception sweet. Lenz Moser is a QmP which means Qualitätswein mit Predikat and is graded in ascending order according to maturity, sweetness and price: kabinett, spätlese, auslese, beerenauslese, trockenbeerenauslese and eiswein.